As the month of May fast-approaches, many efforts are underway nationwide to raise awareness about mental health. 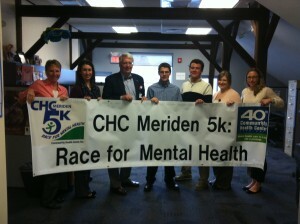 May is officially Mental Health Awareness Month, and the Community Health Center, Inc. is doing its part by presenting the first annual CHC Meriden 5k: Race for Mental Health. Part of the planning committee at a recent meeting! The event – which will take place at 9am on Saturday, May 11th at Hubbard Park in Meriden, Connecticut – will see 100% of proceeds sent directly through the United Way of Meriden/Wallingford to local organizations dedicated to mental health care and improvement. Nine local agencies have agreed to sponsor the 5k (3.1 miles) run, health walk, superhero-themed kids fun run, and health fair, and there will certainly be something to do for the entire family. The concept of hosting a 5k has been discussed for some time now at CHC, Inc., but the tragedy at Sandy Hook Elementary School in December brought a new purpose to holding such an event. The idea was always to send all of the funds raised to a great cause, but the focus on mental health care in the days, weeks, and months following that sad day in Newtown inspired our planning committee to put together a quality event that would shed light on a vital discussion that needs to be had in our society. 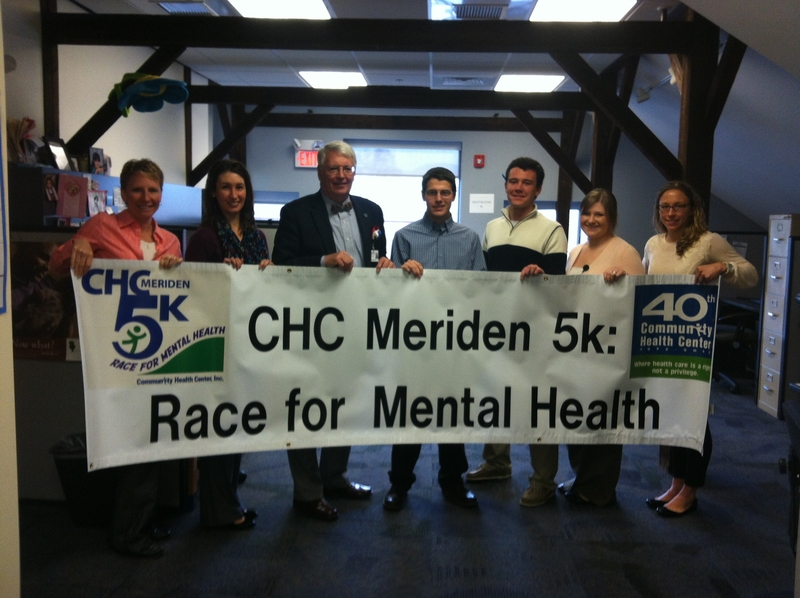 The week leading up to the CHC Meriden 5k: Race for Mental Health is Children’s Mental Health Awareness Week, further adding to the timeliness and necessity of the event. Online registration is in full effect and will be made available until the day before the event. Day-of registration is also available, though there is an added incentive to signing up early. All of those who sign up before midnight on Thursday, April 25th will receive a moisture-wicking race shirt with their $20 fee, with the price going up to $25 the next day. Those who sign up after the 25th are still guaranteed a cotton version of the race shirt, but it definitely pays off to register early! The price is the same for all runners and walkers, and we encourage people of all fitness levels to join us. Everyone can help improve the quality of mental health! As far as the kids fun run goes, all children can be registered for free. Though children will not receive a race t-shirt, they will have the opportunity to decorate a cape immediately following the run. Face painters will be on hand, and a famous superhero might also make an appearance. Capes and the materials to decorate them are also free for all those who register, and a Best Cape Contest will be held during the post run-and-walk ceremonies. Bouncy houses – supplied by the Meriden YMCA – will only add to the fun. After the 5k run, health walk, and kids fun run are complete, a health fair will feature several local companies and agencies that work within the realm of wellness and general health. Be sure to stay around and check it out! Anthem Blue Cross and Blue Shield, City of Meriden: Mayor’s Office, Greater Meriden Chamber: Health Wellness Council, Hunter’s Ambulance, Meriden Department of Health and Human Services, Meriden YMCA, MidState Medical Center, Ovation Benefits, and Rushford Center.